With the recent talk about who might be fit and who might be out for the Barcelona game, today is only about one thing in my mind... three points against Sunderland. All the dreaming about Tuesday night is firmly out of my head. I'm focused on this afternoon's match and believe the team should be as well. We know how well they performed against Wolves prior to the home leg of the tie. A thoroughly impressive professional display which resulted in a 2-0 win. We need the exact same attitude today. Granted we won't have Cesc Fabregas, Alex Song and Theo Walcott in the starting 11 like we did when we faced Mick McCarthy's men, but we've got a squad of players who are all very hungry to play. I expect there will be a number of changes from Wednesday night. Although the manager has said he is "obsessed" with winning this afternoon, he will have one eighth of an eye on Barca and will pick a team which will win the game this afternoon. I'll go into more detail as to who I think will play when I post my team preview piece later. One player who is in the squad and could get a run out for the first time this afternoon in an Arsenal shirt since his horrific injury is Aaron Ramsey. Wenger confirmed yesterday the Welshman was in his squad and said he didn't expect Ramsey to have any of the limitations which Eduardo had when he came back from a similar injury. "Eduardo had problems with the limitation of his ankle mobility when he came back. He was not able to bend his ankle completely when running at full speed. "He needed second surgery but Aaron has no limitations in his movement. So I don't see any problems with his commitment in tackles. "It feels good to have him back because it happened one year ago. He had to be very patient. He will come back better because he is young and you expect him to be stronger." I was told that the main reason we decided to sell Eduardo in the summer was because of the reduced movement in his ankle. It was down to 80% and when we're talking about an athlete competing at the highest level, that is a considerable amount. It meant the spring in his jump was reduced and those first few seconds of a starting sprint were slower. There don't appear to be the same set of circumstances with Ramsey though, which is very encouraging. I'm sure the manager would love to bring him on later, but that decision will be down to whether we're winning or not. After yesterday's interview with the Daily Mail, Samir Nasri has spoken at length with The Guardian about all things Arsenal. It's a very good piece. He touches speaks about this being our best chance to win the league since his arrival at the club. "When I say it is now or never, in French we say this as well, it doesn't mean that if we don't do it this year, we will never win a trophy. "But what I mean is that it is our best chance since I came to a club to do it. It feels like that to me. Chelsea are not as good as last year, Manchester United as well, so it is our time." We are obviously looking for Liverpool do give us a helping hand tomorrow. A win against Manchester United, coupled with three points this afternoon will put us firmly in the driving seat. But we have to take our chances. We can't get scared of going top and maintaining that position. We need to be wanting to be the team expected to win and going out and achieving that. The league is really there for the taking. Who would have though it at the start of the season? We have such a big chance I just want us to grab at it with both hands. And that first step has to be with us taking three points this afternoon at the Grove. 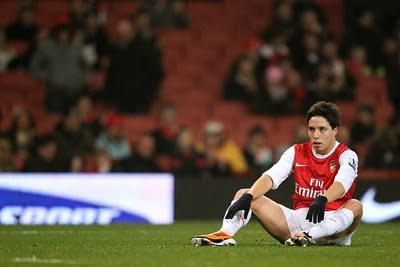 As Nasri says, there is no better chance for us. If you're heading for the game lets ensure the atmosphere is as good as it was against Barcelona. I know it will be hard to replicate because it was such a once in a lifetime game, but this team needs its 12 man and we need to be there for them. A bit of transfer news before I go? Well it seems that Eden Hazard has signed a new deal with Lille. That doesn't necessarily mean he won't sign for us in the summer, but it would mean we would have to pay at the top of the market for his signature. If you haven't read it already, there are some very interesting quotes around from Dennis Bergkamp. Be sure to read them. Finally, congratulations to Arsene Wenger who was awarded the Manager of the Month award for February.